Northwest Tech custom waterproof ski jackets were designed by skiers, for skiers. Our waterproof ski jackets are customizable with different color options, and each is made using 3-layer waterproof breathable fabric composed of a hardshell nylon face fabric, an ePTFE hydrophobic membrane, and a tri-coat mesh lining. Rating: 20,000k/20m2. Each ski jacket comes equipped with durable KEE #8 oversized polyurethane zippers – keeping moisture out when you need it most while you’re skiing. KEE waterproof zippers feature a tightly covered zipper track and a shiny polyurethane coating that creates a moisture tight seal - what every waterproof ski jacket needs. Being skiers we demand ski jackets that fit well and allow for maximum mobility. 270’s on, switch take offs, and backcountry skiing is what Northwest Tech ski jackets were designed for. Slightly longer in length and roomier all around, our custom ski jackets were designed for the powder-seeking, diehard skier. In addition, our waterproof ski jackets were designed for both men and woman. Cuff velcro is key to keeping snow out, yet it’s one of the first areas on any waterproof ski jacket to show wear and tear. Northwest Tech ski jackets use bombproof, triple-stitched, dual-banded velcro that’s available in 8 different colors. Match your jacket’s color scheme or switch it up - we won’t judge! We have both men's and woman's colors so choose what suits your style best. Nothing is worse then sitting on a chairlift getting blasted by wind and snow. Northwest Tech custom ski jackets feature a helmet-friendly hood that keeps the harsh weather out in those ultra-stormy conditions. For the ultimate deep snow powder protection - choose to add an optional powder skirt to any custom waterproof ski jacket. Our leading edge powder skirt design is intended to go hand-in-hand with our custom ski pants and/or powder bibs, however, it's also designed to anchor securely into any other ski pants on the market today - no snaps or buckles make this powder skirt simple and easy to use. Additionally, each powder skirt is highly adjustable allowing for a "one size fits all" secure fit. Custom ski jackets equipped with our powder skirt are sure to keep snow out on the deepest of powder days. Our signature "free ride fit" is unique from a traditional fitted ski or snowboard jacket, featuring an extra long body, large hood, oversized collar, and oversized arm cuffs. This provides a free flowing, comfortable fit that allows for maximum body mobility on, and off, the mountain. Measure the distance from the center of the back of your neck, over your shoulder, continuing down the outside of your arm. Measure from your chin down to find your ideal zipper length. Starting from roughly 1" below your armpit, measure the entire circumference around the widest part of your chest. 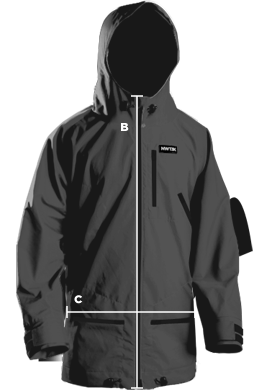 IMPORTANT: The values in the chart below are the sizes of the jackets themselves, so you should add an inch or two to your measurements when selecting a size. If your measurements exactly match a particular size, it's often best to go one size larger so that you have room to layer underneath and have adequate mobility. C. Recommended Chest Circumference 25 - 29" 29 - 33" 33 - 37" 37 - 41" 41 - 45" 45 - 49" 49 - 55"
XS 31 25 25 - 29"
S 33 27 29 - 33"
M 35 29 33 - 37"
37 31 37 - 41"
38 33 41 - 45"
39 35 45 - 49"
40 37 49 - 55"